Suave, understated and elegant. The Mercedes-Benz CLK is one of our favourite coupes of recent years. It may not be overtly sporty, but with its classic lines and beautifully proportioned design, the second generation CLK is a car that looks as good today as it did when it was launched in 2002. For £5000 you don't have to go as far back as that. 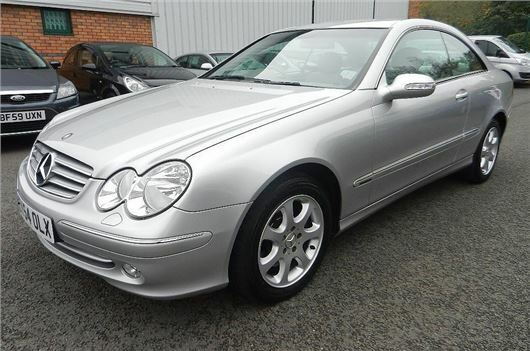 Early examples of this CLK are going for as little as £2000, although with high mileages for the most part. At our £5k budget there's plenty of choice around including this lovely 2005 example we found. It's in classic Mercedes-Benz silver - a very common colour for the CLK - and has only done a mere 34,000 miles. Yep, that's not a typo. In a decade it has averaged less than 3500 miles per year. Which seems criminal given how lovely the CLK is to drive. But good news if you're buying second hand. You'll often see the 'only just run in' quips on used car adverts, but in this case it seems very true. It's not the common entry-level CLK 200 Kompressor model - rather this is often overlooked CLK 240 which, despite the badge, is actually powered by a 2.6-litre V6 engine. It's a decently smooth unit that has more than enough get up and go if you need it with 170PS. Okay, so it's not the top CLK 320 version and there is of course the bonkers CLK 63 AMG with its monstrous V8 engine. But this CLK 240 still has plenty going for it. Not least the fact it is a one owner-from-new car. It looks in superb condition for a ten year old car - we've seen 12 month old cars that don't look as well cared for. The CLK is reasonably reliable too with few issues reported to us aside from one case of badly frayed seatbelts sufficient to fail an MoT - which seems an isolated incident - and rusting wheelarches on a 2003 model. Apart from that we've heard mainly positive things from owners with a host of four and five star owners' reviews. Saying that, the gearbox electrical plug oil seals can fail and Mercedes-Benz wouldn't at the time repair these under its warranty as bizarrely the seals are not covered. But the cost should be no more than £150. There were several issues with the Mercedes-Benz V6 engine codenamed M272, including problems with the balance shaft gears that led to a class action lawsuit. Fortunately this CLK 240 engine is not affected, only the later 280 engine that replaced it. As for running costs - well the CLK 240 isn't that cheap. Annual road tax is £290 - although it could be worse as by rights it should be £490 given the CO2 emissions of 250g/km. But as this CLK 240 was registered before March 2006, it is exempt, instead qualifying for the band below. Official fuel economy is 27.2mpg and you'll be luck to see mid 20s in everday driving. The CLK 240 may be a bit of an unloved model but we think this one is a real gem. Low mileage, classic colour and well loved, it's a great buy for £5k and a car that you'll always enjoy driving.